Flexstone’s textured stone finish provides a luxurious and highly functional deck surface that is eco-friendly, lasts a lifetime, and looks fantastic. 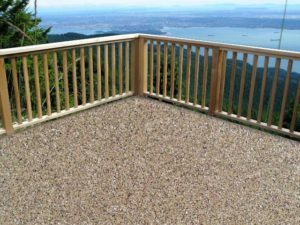 Flexstone Coatings (formerly known as Tufflex) have been quietly providing waterproofing solutions in Greater Vancouver for nearly 20 years. The eco-friendly liquid-applied water catalyzed urethane was adopted by a local waterproofing company (that eventually became Flexstone) as a way to solve many of the problems associated with the leaky condo crisis in the 1990’s. This included use on sundecks. Today, Flexstone has full CCMC approvals and the urethane coatings are being distributed all across Canada for applications including decks, flat roofs, walkways, ship decks, and vehicle parkades. Originally, the coating was developed specifically for ski-resorts decks. High-altitudes, dramatic temperature fluctuations, and heavy foot (and ski-boot) traffic proved too much for products like vinyl to last any longer than a few seasons; thus Flexstone arrived. Flexstone coatings retain their flexibility for decades, even in extreme heat or below freezing temperatures. It’s waterproofing capabilities are second to none. Due to Flexstone Coatings’ success in some of the harshest environments in North America, it’s transition into the Canadian market just made sense. Drytech are now the exclusive distributors of Flexstone and have since helped evolve the product to include more luxurious options as well as helped introduce the product to new markets such as flat-roofing, ship decking, and vehicular re-surfacing. Flexstone is now being applied all across the country. But we’re not done there. We are currently still recruiting dealers in some markets that every Canadian has the option of having the world’s best coatings applied to their sundeck, garage floor, or roof. There are still opportunities available for contractors to handle Flexstone in certain markets across Canada. If you have a sundeck, construction, roofing, or waterproofing company and are interested in adopting Flexstone Coatings, please contact us with any questions or navigate to our “Become a Flexstone Dealer” page to learn more. We expect Flexstone Coatings to have a great year and eventually grow into the primary general waterproofing solution for Canadians.